It’s hard to believe that by the time your child is in Kindergarten they have watched nearly 4,000 hours of TV. Experts agree, this is too much. However, banning TV altogether isn’t the answer. There are many age appropriate shows that can spark your child’s imagination and interests. As parents we should monitor not only the time children spend watching TV but the quality of the programming. Instead of letting your child have free reign with the remote you need to take into consideration your child’s age and choose shows that you want her to see. For example; Madalyn, age 7, loves to sing and dance. Picking shows that revolve around these concepts keeps her interested and she often sings and dances herself. It isn’t unusual for her to not learn the songs and sing them on her own. It’s up to you to determine how much TV is too much, experts suggest no more than 2 hours per day however, that is completely up to you. For many parents even 2 hours seems like a lot of TV. Nevertheless, it is important to know how much time your child is spending watching TV so you can make the decision. It is challenging to entertain children when they get home from school or during the weekend when it is pouring rain. Parents need to cook, clean and take care of their own needs. The key is to find the balance that works for you and your family. There are many things your child can do besides watch TV and a great way to discover what they are is to sit down together and brainstorm other activities. There are many things your child can do on her own to keep busy but it is still important to interact with her and have fun. Set a night of the week to go to the local library, play board games, a family movie night, play catch or have a tea party. TV shouldn’t be a substitute for raising your child but it can offer many different learning opportunities. Reading to your child is a fun and educational activity you can both enjoy, no matter how old your child is. By reading to your child from the time he or she is an infant, you will help develop a lifelong love of books, and of learning. You will also contribute to your child’s early reading ability, helping to prepare them for school. It is never too early to start reading to your child. One study performed in Rhode Island showed that infants who were regularly read to had a higher percentage of receptive vocabulary (meaning, words they understood) by the time they were 8 months old when compared to children who were not read to on a regular basis. There are many different types of reading activities parents can enjoy with their children, and the best part is, they’re all free! The local library, or bookstore, are excellent resources for reading activities for parents and children to enjoy together. Every night, read one or two books before turning out the lights. Use voice inflection to animate the story and keep your child interested. Encourage them to point out the characters in the book. Point out colors, numbers, and shapes throughout the story, giving your child a head start on important lessons that will prepare them for pre-school. Another fun activity in this age category is Story Time. Check with your local library or bookstore, as most offer several per week. Continue with your nightly routine of reading a book to your child before bed. Encourage your child to point out words they recognize. If it’s a book you’ve read many times, encourage your child to “read” it to you, instead. Children in this age category enjoy art projects. Have them write their own book, where they draw the pictures and you write out the words. Have your child read a short story to you every night before bed. Continue visiting the library, and apply for their very own library card. At home, create vocabulary projects such as alphabetizing words, sentence structuring, and crossword puzzles. You can even go online and print some of these types of activities off the Internet. By encouraging your child’s love of reading, you’ll be setting them up for success in school, and life. Stay involved every step of the way, and remember to enjoy this precious time together. Studies show that parents who are involved in their children’s lives by regularly engaging in family activities together, consistently have children who show less hyperactivity and aggressive behaviors than parents who are not as involved. If you are looking for activities to enjoy with your child, but aren’t sure what to choose, consider the following five ideas. Some are reasonably affordable while others are completely free. The important thing is to just get involved, and enjoy yourselves! Your local library or nearby bookstore should offer these a few times per week. Most are open to all age groups, however, some offer special programs for infants and toddlers. Studies show children who are regularly read to not only develop a lifelong love of reading, but also of learning. The best part about Story Time? It’s free! Music, dance, tumbling, martial arts- these are just a few! Check with your local YMCA, or a local, private, company, for information on family-centered classes. Art, music, and dance classes expose your child to different cultures, which helps to develop their appreciation for things around them. Tumbling or martial arts classes will burn off extra energy, and help develop healthy habits. Don’t just go to the zoo, get involved! Most zoos offer children’s programs where your child can join the crew behind the scenes, or become a zoo-keeper for a day. Your child will learn responsibility when taking care of the animals, as well as the importance of protecting and preserving their natural environments. If you’re lucky enough to live near one, go! These museums are specifically catered to young children and their sponge-like minds. Hands-on learning opportunities in math, science and art abound at children’s museums. If you don’t live near one, check with your local art or science museum, as most should offer special education programs for children. Your child’s imagination is complex and unique. By joining your child in free-play, you can take the opportunity to throw in educational lessons. If your child loves to play astronaut, use this to your advantage and teach them about space shuttles. Just keep it simple and on their level. Being an involved, encouraging, and devoted parent is the single most important gift you can offer your child. Don’t waste another minute. The sky is the limit when it comes to fun activities for parents and children. Find something you both love and go enjoy it together. Chore charts or sometimes called behavioral modification charts, I prefer chore charts, can be a great way to get your kids to participate around the home or improve their current behavior. These charts may sound very different, however, the anticipated results are the same. For example; I used to have a difficult time with my daughter staying in bed all night. Ninety percent of the time she ended up in mine that is until I created a chore chart for her. On this chart were things such as brushing her teeth, sleeping in her bed, picking up her toys, and feeding the cat. These were all things that at her age, five years old, were very doable. Matter of fact she was very excited because with each accomplishment she would get a sticker on her chart and if the weekly results were good she would also get a special treat such as a new toy or an extra popsicle for dessert. I even give her an allowance of $.50 per week for her to put in her piggy bank. Heck at five years old that looks like a lot of money especially if some of it is in pennies. 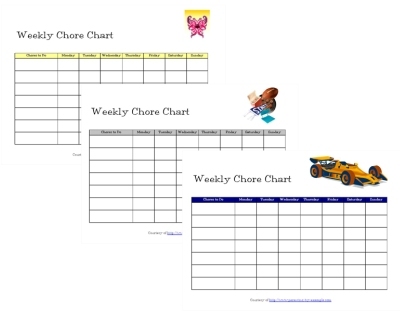 Chore charts can be used for children, and even adults, of all ages. For younger children it is important to remember that they aren’t perfect and can’t do complex tasks. They probably won’t remember to do each chore everyday but then again neither do I. Both you and your child will get great satisfaction out of completing the weekly tasks. Young children love to help out around the home, in fact, you probably don’t have to put to much on their chore chart to get them to do so. Here is a list of some typical things that children in this age range can do. If you think that these tasks seem to be too much for toddlers you will be surprised. My five year old does all of these things and it is a blast. She is always there to lend a hand and when she gets a sticker on her chart for completing on of the above she smiles from ear to ear. Also when you do this you are building independence, teaching responsibility, and building their self-esteem. I have created some simple chore charts for you to use, to get you started. I highly recommend spending some time with your kids making one together that is fun and silly. Makes for a great art project on a rainy day. As the cook in the family, it is nice to have help at times when preparing dinner. Kids love to eat and they love the sweet stuff but it is important to make sure they get plenty of nourishing foods to help them grow and live healthy lives. Any quality time that is spent with the children won’t go unnoticed or unrewarded. Letting the kids help with cooking is a great way to spend quality time with them and they may be more inclined to eat what they have so messily help create. As with everything the more they help the better they will get at it. It takes a bit of time to get used to some of the tools of the trade when cooking. My daughter loves to help me crack and shell my hard boiled eggs which I eat almost daily. She does a great job of sprinkling her cheese on her nacho chips. If we are making homemade pizza she loves to put the toppings on after I have prepared them. Lets not forget about making cookies, that has to be one of the all-time best cooking activities for kids. There are many things that you can do to involve the kids around the kitchen. Imagine the feeling of pride and accomplishment that your kids will feel when you let them help you cook. It is a fun time for all of you even if it does get a bit messy. Everything cleans up easily and quickly so don’t fret if they make a bit of a mess, that is part of the learning experience. In our busy lives these days it seems we are constantly on the go and there just isn’t enough time in the day to spend the time we should with our children. Cooking with our kids helps to close that gap and provides fun and memories for everyone.